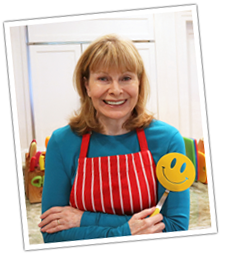 Vicki asks… How long should spices be kept? I never know when to throw out and replace so I seem to have multiples. I don’t know if they are any good when I need something. 1. Lose the spice rack. Store your spices away from direct light or heat. The worst place would be out in the open on the back of the stove. I store mine in a drawer. 2. It’s a good idea to mark the bottle or tin of spice with the date you opened it. 3. Never shake herbs or spices out of the bottle directly into something you’re cooking – that’s the quickest way to steam and spoil your spices. 4. To test a spice’s potency, rub some in the palm of your hand. If it smells good, it’s good. That’s what I do. 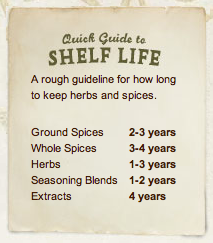 2 Comments on "How Long to Keep Spices"
I am a student studying chemistry. My group and I have to complete a science project on cooking and have to ask a possible expert. We were wondering if it was possible to make butter cookies in a microwave oven and how would baking them that way affect the taste? Answers would be highly appreciated. I’m sorry but I have never baked anything in a microwave. I wish you best of luck with the project and compliment you on such a worthwhile course of study.